On this day in 1906, the famous mobster Benjamin "Bugsy" Siegel was born in Brooklyn to Max and Jennie Siegel, a poor Jewish immigrant couple from Eastern Europe. Bugsy was the second of five children. He dropped out of school and joined a street gang, mainly committing thefts until he teamed up with Moe Sedway and started extorting money from pushcart vendors on threat of arson. 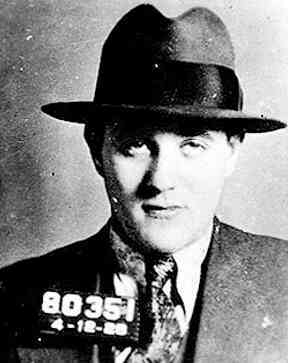 As a teen, Bugsy was recruited by Meyer Lansky (aka "the Mob's Accountant") and he became a bootlegger and a hitman. Together they headed the Bugs and Meyer Mob. This was in the early days of prohibition, and the Bugs and Meyer mob did bootlegging, truck theft, "protection", illegal gambling, and murder. They operated in New York and New Jersey. They were the predecessor to what the press would later call Murder, Inc.
Bugsy Siegal was blue-eyed, handsome, and charming. He was also violent and "crazy as a bedbug." In 1929 Meyer Lansky organized the first conference of mob bosses in Atlantic City (while he was on his honeymoon, by the way). Bugsy was the there and came to an understanding with young mafioso Lucky Luciano. That conference was successful in establishing cooperation among the various crime mobs. Incidentally, earlier that year Bugsy had also gotten married, to his childhood sweetheart Esta Krakower. Following the conference Luciano hired Siegal and his gunmen to eliminate his enemies and rivals, including Salvatore Maranzano, who was capo di tutti capi of the Mafia, so that Luciano could head the Mafia. Probably realizing that it just painted a target on his back, Luciano declined to be the next capo di tutti capo and the position was replaced by a ruling council called The Commission. Luciano and Lansky then formed the National Syndicate and Bugsy along with others founded Murder, Incorporated, as its enforcement arm. In the late 1930s, when the East Coast got too hot for Bugsy, the mob sent him to California to develop the gambling rackets with the Los Angeles crime family. He was very successful, building a numbers racket, drug routes to Mexico, prostitution, and controlling offshore casinos. He had his family move to California as well. Bugsy decided that it was time to be a legitimate businessman and decided to take over a hotel in Las Vegas, The Flamingo. The Flamingo was already part of the syndicate, and Bugsy decided to make the owner, William Wilkerson, an offer he could not refuse. Bugsy's vision was to turn the Flamingo into a hotel and casino that provided the best booze, gambling, and entertainment to cater to both high rollers and regular vacationers. Bugsy acquired the Flamingo Hotel in May 1945, and began an extravagant remodeling. During this time Bugsy had started trying to break from the East Coast mob, refusing to remit payments and pouring it into the Flamingo as investment instead. The Flamingo opened the day after Christmas in 1946. It was a flop, and a month later it was shut down. The mob investors were not happy at all. Undaunted, Bugsy convinced his mob investors to give him a second chance and the Flamingo reopened in March 1947 with a better business and publicity plan and started turning a profit. But Bugsy did not have long to enjoy this. In June 20, 1947, an unknown gunman shot Bugsy through the window of his Beverly Hills home multiple times, ending the life of the poor kid from Brooklyn who had made it to the top of the criminal world. Bugsy Siegal's life has fascinated Hollywood. Warren Beatty played him in the award-winning movie Bugsy (1991). I'd also like to mention the movie Murder, Inc. (1960) which although it does not include Bugsy, is a great fictionalized story based on the true-crime book by Brooklyn D.A. Burton Turkus.